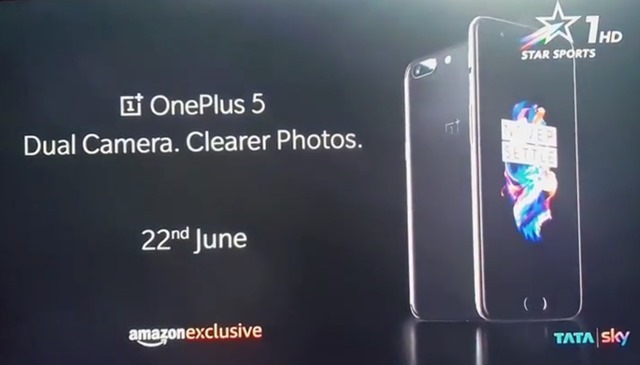 The OnePlus 5 will be officially unveiled tomorrow globally, followed by an exclusive India launch on June 22nd, i.e, Thursday. But the Chinese OEM just couldn't wait to show off the flagship device, and a TV ad during the India vs Pakistan Champions Trphy final, revealed the phone officially. The photo you see above is the OnePlus 5, as seen from TV ad which was broadcasted on Star Sports, and a video of the same can be seen below. The OnePlus has dual rear cameras, along with an LED flash, a front facing home button, which doubles as a fingerprint scanner. This does match with the previous leak which we reported about. Though the match didn't go our way, OnePlus surely knows How to grab the attention of the Indian audience, and a cricket match between the two rival Asian Countries was a perfect way to ensure that word about the phone spread quickly. This is the first time, that OnePlus has invested in ads, and in India, they don't come cheap, when the ad features Bollywood Superstar Amitabh Bachchan, and other stars. This does cause concern though, as OnePlus could potentially increase the price of the phone, to compensate for fee it paid for the ads. But then again, OnePlus has been manufacturing its Phones in India, which means it does not have to pay customs and import fees. We can only wait until June 22nd, for the phone to be launched. And as we previously reported, the OnePlus 5 will be sold exclusively on Amazon India. But the glaring question is, if OnePlus can invest (potentially millions for movie stars and cricket stars) in TV ads, why can’t it invest in a developer team to provide proper OS updates, such as the Nougat update for the OnePlus 2 ? So, before you buy the OnePlus 5, you may want to read our opinion piece on flagships and Android updates.